December has come and Catalonia offers plenty of possibilities if you want to make the best out of this month. Chrismas markets, film festivals, concerts, New Year's Eve celebrations... But first of all, make sure to catch these month-long events before they go away in the coming days. To get a chance to see some quality professional photography and leave Barcelona – even to go south, as the weather gets warmer – check out this event in Tarragona, set up to foster the art form and reflect on its purpose and future. It ends December 9. If you love being in nature, want to take advantage of the fact that it’s not quite so cold yet, and want to try some of the best cheeses Catalonia has to offer – this is the tour for you. It takes you to various artisanal cheese-making centers near the Pyrenees at the Espai Ermengol – not to be missed for foodies, running until December 9. This iconic performing arts festival presents itself as “a meeting point between the Catalan and international scene,” this is perfect for theater lovers who want to see the latest and greatest that this timeless genre has to offer – from local Catalan productions, to European and even worldwide plays, and much more. It ends December 10. This is an opportunity to see jazz – and much more, including Avishai Cohen or Amadou and Mariam, and even films on the topic. Positioning itself as “one of the most important jazz festivals of its kind in the world,” it can be found at various venues like the swanky Luz de Gas, the iconic Harlem Jazz Club, and even the prestigious Liceu opera house. The extensive festival includes various sub-events, including one dedicated to flamenco, and it goes until December 21! Are you fascinated by robots, artificial intelligence, and how it all interacts with humans? At the CosmoCaixa space, free of charge, this propositions promises to be avant-garde, fun, technological, and thought-provoking, running until the very last day of December. Defining itself as the ‘winter Sant Jordi,’ this is the perfect opportunity to get a loved one the gift of a book—or even just to get yourself a present, just in time for the holidays. Start the month off right with literature and reading, held at the Antiga Fàbrica Estrella Damm in the Catalan capital. For art, fashion, photography and decoration lovers, this ephemeral market is the place to be. Each one is different, but watch out! The space is small and intimate, so you need to sign up to participate. And if you’ve never been to this unique and artistic flower shop, we highly recommend you take a look—even the space itself is a work of art. Capping off the month, the third edition of this event will be separated into three arenas: Games Play, Games Pro, Games e-sports and Games Fun. With an agreement with the competitive OG Sèries platform, this event will even have a space for mobile games. In all, a perfect day of fun for both amateur and professional gamers! Held in the Catalan capital, the second edition of the contemporary art film festival will feature names like Yayoi Kusama, Rafael Lozano-Hemmer, Marisa Merz, and more. Screenings will be carried out both in Spanish and English—a must-see for art or documentary lovers. The six annual edition of this photography festival brings you snapshots through the lens of love—but also, tackling current and difficult topics, such as love as old age and even the legalization of abortion. Here you can see the work from leading professionals in the sector, including César Deszfuli, Nancy Borowick and Jane Evelyn Atwood, with activities and more included. If you thought you had seen the last of Barcelona’s widespread festivities—never fear, there’s one left! The Sant Andreu district in the north of Barcelona closes off the year from November 29 to December 8, including human towers, dancing giants, and more! 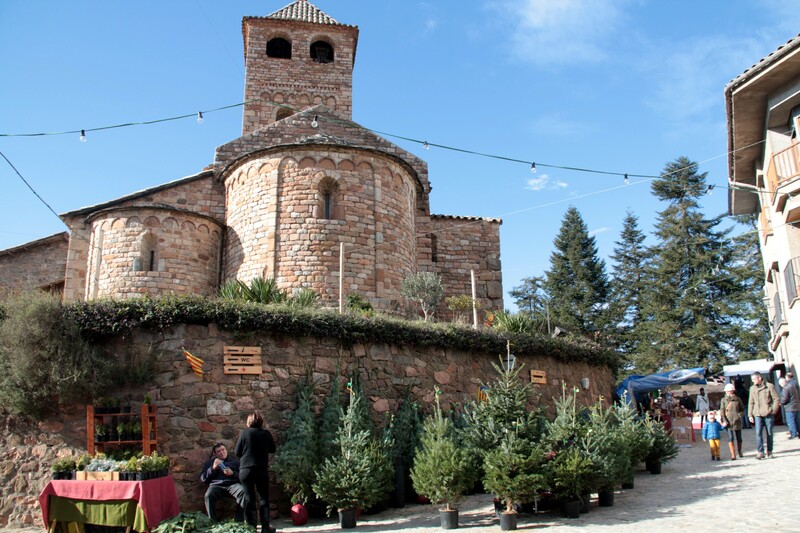 To the north of Barcelona in the Catalan countryside, this is the most well-known market to buy holiday fir trees in all of Catalonia. But not only that: if you want any sort of Christmas, holiday, or wintertime food or object – you’ll find it here. Anything from tasty treats to the particular Catalan traditions like 'caga tió' are on display in this picturesque town. Meanwhile, down south, the Rec film fest ushers December in. Check out their list of screenings to choose just what suits you, from award-winning animated feature lengths to documentaries, and much much more! For those who need a thoughtful gift or just love markets, and who especially want to support local creators and who appreciated handcrafted work, then this is the perfect event. Over 20 makers will be there, including names like Ann Acid, Bandidasbcn, ZydoLa, and more. Found both in Barcelona and Madrid, this edition in the Catalan capital claims to bring “vintage and second hand curated treasures,” perfect for those who want to be more eco-friendly, and those who enjoy a good vintage find. Held under the light-flooded vaulted ceilings of Barcelona’s Estació de França, this lost treasure market might just hold what you need. And if you’re feeling especially motivated on this day, there's not just one market – but two! This is for those who aren’t trying to break the bank – although entrance is set at €1, everything inside is priced at under €5, for the best bargain in town. Do you love Italian cinema, and do you want to enjoy the newer additions to this already incredible cinematography? The annual two-day event dedicated to the flicks comes to the Verdi Cinema in Barcelona’s charming Gràcia neighborhood, featuring everything from feature-length films to special screenings, and short films, too. Priced at €15 not including expenses, this is a great pre-holiday concert for those who want to discover more Catalan music. This also falls on the 75th anniversary of the iconic Apolo Theater where it’s held, which itself has been key in the band’s success. Don’t miss it! If you’ve passed by Barcelona’s iconic cathedral, you may have noticed a very Christmas-y addition to the square: the annual holiday market is up! Its actual name is the Santa Llucía fair, and it runs until December 23, the perfect destination for a holiday stroll, and to find the perfect gift without straying too far from the center. There’s just something about the holiday season that lends itself to classical music, the ballet…and opera. If you’ve never been to Barcelona’s iconic Liceu theater, now’s your chance, with their performance of L’Italiana in Algeri by Rossini, running from December 13 to the 23. There’s nothing like some good art to make a space feel like home—and Barcelona has no shortage of talented illustrators, designers, photographers, and artists. If you’re in need of something new for you or a loved one, the Dress Your Wall Market is the place to be. The seventh edition of this event focuses on emerging artists, just the place to discover something new and to foster local creativity! Another market to check out this weekend, again at the iconic Barcelona vaulted train station, is the ‘Design Station’ event—featuring varied spaces for all tastes like Espai Moritz Disseny, Espai Give' me 5!, and Espai Juegos Retromodernos (Retromodern games), providing something for everything. And, as with all markets, there’s food, too! And stay tuned for our New Year’s Eve events in Catalonia…don’t miss it!